Many residents of Charlton will recognise the name from Hornfair Road or Hornfair Park. Some will have gone along to one of the revivals held this century in the grounds of Charlton House. The modern fair is a pale shadow of the original, which was a much more riotous occasion, and one of London’s most popular fairs, according to contemporary accounts. It was suppressed because of the drunken behaviour of fair-goers in 1874. We know that in 1268 King Henry III granted a three-day fair to the Abbey of Bermondsey to be held around Trinity Sunday, which is the eighth Sunday after Easter, that is, around May or June. Bermondsey Abbey owned the manor of Charlton at the time. Around the 17th century the date of the fair was moved to 18 October, which is the feast day of St Luke. Charlton’s parish church is, of course, dedicated to St Luke. In medieval pictures Luke is invariably seen in writing or painting posture, with a horned ox or cow prominently displayed. It is likely that the carrying of a large pair of horns on a pole indicated the opening of St Luke’s Fair, and may be the origin of the horn motif of the fair. 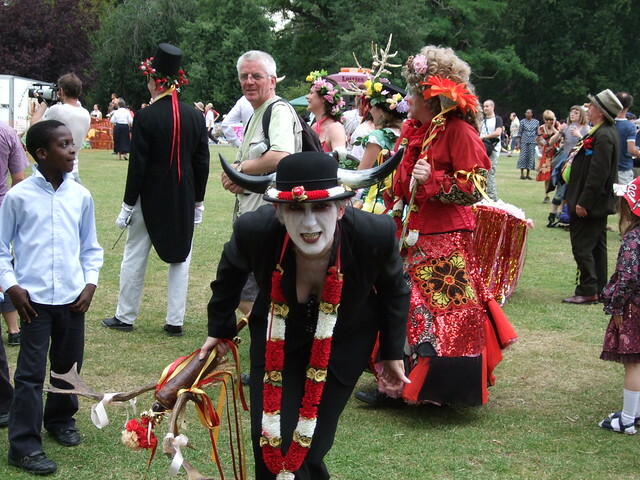 The fair would begin with a parade from Bermondsey to Charlton, with the revellers wearing horns, and blowing on the musical versions of them. Many would wear fancy dress, including cross-dressing. The tradition of the parade was revived in 2009 – the IanVisits blog describes the start. An even more notorious fair used to be held in Donnybrook, which is nowadays a peaceable suburb of Dublin, probably not unlike Charlton. It was licensed by King John in 1204 and was suppressed in 1855 for the same reasons as Charlton’s Horn Fair. The word “donnybrook” entered the language as a slang term for a brawl. Just think: if things had been slightly different we might have been calling a punch-up a “charlton” instead!